Good Earth Tea is a unique, 100% natural tea brand that celebrates bold individuality and unique creativity in every tea flavor. We create imaginative, full- flavored, healthy teas using only the highest quality ingredients from around the world in the rich-tasting combinations that make up every Good Earth Tea flavor. All Good Earth Teas contain absolutely no sugar, artificial flavors, colors or preservatives. They are also free of MSG, gluten or soy. Good Earth Tea was one of the first herbal tea companies during the 1970's in America. In the late 1970’s, the company began developing trademark teas for Good Earth restaurants and later began selling Good Earth Tea in bag form in the California market in 1988. Good Earth is now part of the Tata Beverage Group, the largest India-headquartered multinational in North America. The Tata Beverage Group also includes award-winning Eight O'Clock Coffee and Tetley Tea. 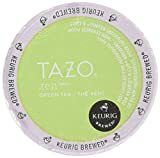 Tazo Concentrate Chai Latte Tea, 32 Ounce - 6 per case. Tazo Concentrate Chai Latte Tea, 32 Ounce -- 6 per case. A spiced tea with ancient Indian roots, Tazo Chai blends full bodied Assam teas with aromatic spices from around the world. The malt and astrigency of the black tea is complemented by sweet cinnamon, spicy ginger, fragrant cardamom, star anise and cloves. Just like it sounds... a delightful cinnamon flavor from an old-fashioned recipe. Davidson`s blends three varieties of Tulsi (Krishna, Rama and Vana) with the smooth and mellow flavor of golden chamomile flowers. Chamomile has long been known as a mildly relaxing herb. 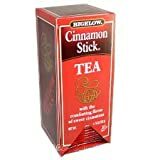 Tazo organic apple red herbal infusion, caffeine free, 20-count tea bags (pack of 6) is a sweet African red tea with real apple, cinnamon and the flavor of caramel. All natural. Tazo happens when one combines amazingly flavorful teas with a fertile imagination and some other good things from nature. In Tazo Organic Apple Red, you will find the satisfying taste of real apple, sweet cinnamon and rich caramel flavors swirling within a cup of organic rooibos: a South African herb blessed with antioxidants, but nil caffeine. One sip of this red tea may inspire you to do great things. Or to simply do nothing at all, which can be great in and of itself. USDA Organic. Certified organic by QAI. Made in US from imported botanicals. Tazo® ZenTM Full Leaf Tea Tazo® ZenTM Tea is a refreshing and invigorating blend of full-flavored, pan-fired green teas from China, blissfully combined with lemon verbena leaves, lemongrass and spearmint. The sweet, lingering flavor of this full-leaf tea can't be fully expressed in words, but must be directly experienced. When stress has a hold on you, take a break and brew a cup of kava stress relief. Native to Oceania and the south pacific islands, kava has traditionally been cultivated for its power to calm the body and mind and encourage a good night's sleep. Kava is also recognized for its ability to promote a state of relaxed awareness without compromising mental functions. Yogi's kava stress relief tea combines this relaxing herb with cinnamon and sarsaparilla to add warmth and spice, and carob pod for rich flavor. Relax and find tranquility with a warm soothing cup of kava stress relief. Yamamotoyama tea bag products are 100% natural and Kosher Certified. Sencha Loose Tea's impeccable qulaity is the hallmark of this fine tea, made with 100% Japanese Sencha green tea and is the most favored tea in Japan as a relaxing afternoon drink.